Browns Campus Center, an 11,997 sq. ft. building, is the central hub of the Hanover College campus in Hanover, IN. The center is home to a cafeteria, dining hall, administrative offices, classrooms and a student common area in the basement. The building persistently leaked for some time and, due to its prominent role in campus life, any damage stood to disrupt daily college activities. 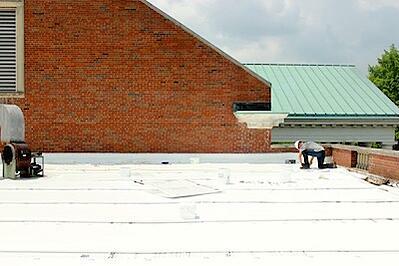 Having already worked with Exterior Pro Roofing on its Lynn Hall project, Hanover College called us to inspect the roof and offer a solution. Considering the center’s flat roof had already been fitted with a Duro-Last 40-mil. commercial roofing membrane, our experience made us an ideal fit. Exterior Pro Roofing arrived on the scene and began their initial inspection of the flat roof, expecting a routine fix. Instead, we discovered that the flat roof had extensive hail damage. It had suffered through several severe storms, and the hail had fractured the membrane. After this discovery, we recommended that the college file an insurance claim for the roof, and shortly after a commercial insurance adjuster arrived to inspect the damage. 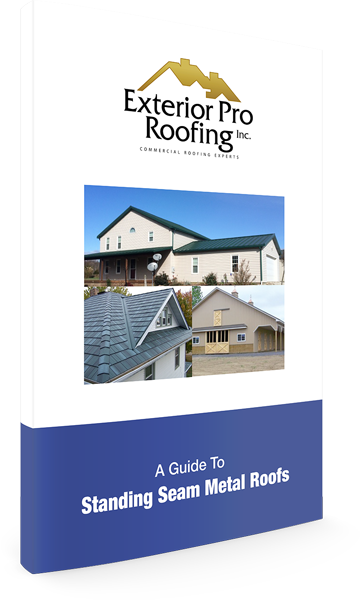 Exterior Pro Roofing worked with the insurance adjuster, along with a representative of Hanover College, to ensure that all parties were on the same page. Through collaborating with the adjuster, we ensured that Hanover College paid nothing out of pocket for the repair. A ½ in. of insulation was laid over the concrete deck, with a 50-mil. Duro-Last membrane mechanically fitted over top. A 50-mil. membrane was used because it had a 20-year warranty. 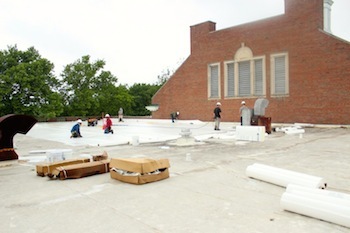 While installing the new Duro-Last membrane, we replaced the curbs on the HVAC units along the roof. This provided additional stability for the units, making them less susceptible to harsh weather conditions. The masonry walls were also encapsulated. New scuppers were fitted on the roof’s parapet walls, so that any water hitting the roof could be drained properly. This job was a perfect example of how Exterior Pro Roofing was able to help the college save a substantial amount of money, through both our expertise working with insurance adjusters and quick, efficient Duro-Last repairs. Today, Browns Campus Center is open for student activities, and the college no longer needs to fear harsh weather.